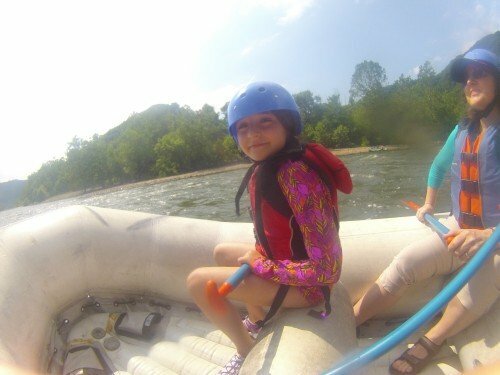 Before I tell you about the Daddy/Daughter trip to Adventures on the Gorge, I need to give you some background. First, my daughter is reaching a stage of her life where she is pushing her independence. She’s discovering more of what she wants to do, and the confidence to do it on her own. This breaks my heart but I recognize it as a necessary stage. Then again, that which you recognize with your head doesn’t always translate to your heart. So of course, I want her to do her own thing, but would it kill my daughter to miss her dad every so often while doing it? Secondly, while I am an Eagle scout, rationality has overcome the exuberance of youth. In my past, there were many stupid things I would do, but now I’ve come to the opinion that attaching myself to a wire a few 100 feet in the air isn’t going to extend my life. Thirdly, it was a Daddy/Daughter trip. That said, the emotional responsibility of determining the optimal way to brush her hair was on me. (According to my daughter, I failed on that job numerous times.) My wife, on the other hand, seemed quite happy with the emotional break and relished a quiet home without us. So now, I had an additional level of anxiety of being the only parent responsible for ensuring that my daughter does not act like a lemming when passing the nearest cliff. So, imagine, me and my 9-year-old daughter not only facing adventure but facing the challenges of parenting a nearly 10-year-old. With that background, Adventures on the Gorge was both a perfect location as well as terrifying for exactly the same purposes. The key word in the title adventure, did scare me based on the three reasons listed above. Basically, Adventures on the Gorge is a resort that is effectively a base camp for dozens of possible adventures. As for the “Gorge” portion, that’s the New River Gorge. Picture the Grand Canyon but with a beautiful river and trees. So here’s the day by day account according to my psychologically traumatized notes. We arrived via the Amtrak which is much less stressful than driving. It’s not a bad way to get to West Virginia compared to driving. The Cardinal goes three times a week so it’s a good way to take a work day on the train and then you’re ending in West Virginia. You can sit back, relax, and can work on the laptop while your kid avoids the outdoors by surfing the Wi-Fi on their iPad. From New York to Washington, there’s a ton of metropolis and buildings, but, after that, it’s farmlands and rolling hills. I appreciated the scenery and got much less work done than I think I should have. Anyway, back to the Daddy/Daughter part. Day One was basically settling into our higher end cabin. As I mentioned, I’ve roughed it camping in the past and had no interest in reliving that now. I needed a place to wash clothes, have her watch TV, and I needed a hot tub in the woods. The hot tub, at times, was more necessary than the other details. 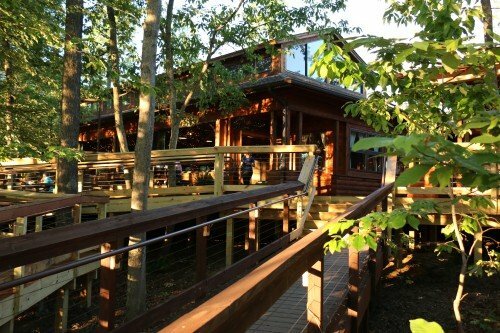 The cabins are a short walk from the main area and we had dinner at Smokey’s on the Gorge. Now, I described the three basic key issues in the beginning of this, and this is where they started to kick in. First, when it comes to traveling, just me and her, I liked that everything I needed was within walking distance of the cabin. Sure, I could have roughed it and lived in a tent, but seriously, that was not on my personal forecast. I liked that the food was here and the store and, really, all the amenities. I didn’t like that my daughter, however, felt it was a safe enough environment to start exploring her areas. She should have missed her daddy but, instead, felt comfortable walking around with her new friends. I couldn’t blame Adventures on the Gorge for that, but rather a daughter’s basic human evolution. The second day was rafting on the New River. The new river is in fact not new, but is a river, so it’s half right. In actuality, it’s one of the oldest rivers in the world and simply is called “The New” because it was new to the explorers. 1) She took complete control of the situation and kept us safe. 2) She was brilliant in dealing with my 9-year-old and balancing safety while getting my daughter to test her limits. 3) I trusted the guide to do the said task above. As a dad, it’s my job to be a paranoid lunatic, especially when rafting down a river. It’s the 9-year-old’s job to push the limits. 4) She was a brilliant role model. I’d much rather the little girl see a strong woman who can control the raft than a dad who was not necessarily in the mood for this. We stopped along the river, set up a picnic and I tried to lead the kids in a game of helping to clean up the river. Maybe it was leading by example and, maybe later, my daughter will remember the lesson. Later that night, we headed to Chetty’s Pub back at Adventures for Wing Night – a great weekly event where the people at Adventures and the locals get together. Again it seemed the theme was conquering my fears as equally as my daughter expanding her limits. 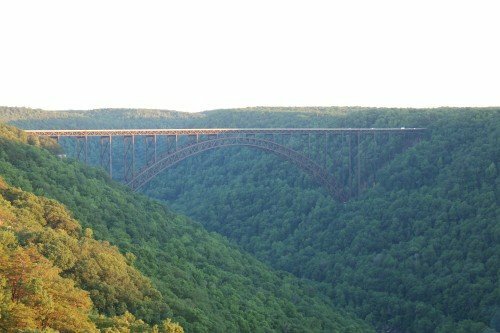 This third day, the brilliant idea was to explore the New River Gorge National Park as well as to walk under the bridge on their Bridge Walk. This felt like a stupid idea. People like it, but I only see death and falling. Most of the event found me terrified and visualizing my child and me to our doom. Needless to say, I lived to tell the tale and even have some rather good photos, but I don’t deny that it tested my emotional limits. Was that good to test your limits with your kid? Probably, and I don’t deny neither of us see it at the time. She doesn’t see it with the symptom of age and I don’t see it with the symptom of fear. That said, out of great stress can come great memories. The rest of the day, fortunately, was much easier. It was back at Adventures for the pool, hot tub and dinner. Today was the Timber Trek Zip line/Ropes Course and then getting ready to head home. 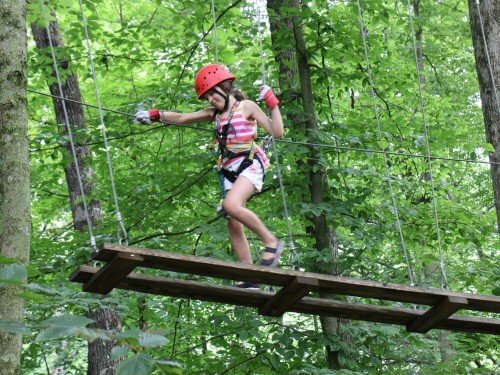 What I honestly loved about the ropes course was that it had a thrill level to keep her excited but between the guides and the safety system I knew she was in good hands. I did the first three courses with her and then let the girl take it from there and she did two more on her own. But that was a bit of the theme of the trip. She was pushing her limits. She didn’t need her dad as much and while that’s a heartbreaking thing, it’s also a good thing. She was able to do this course entirely on her own and was proud to do so. Adventures on the Gorge really covers the gamut of adventure. 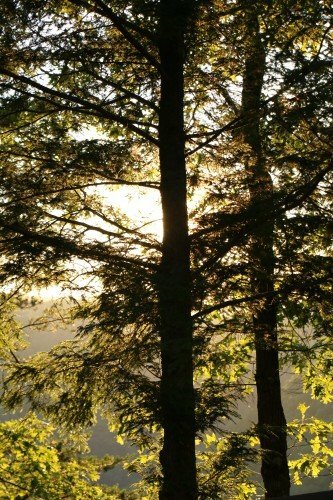 As I started with, the idea of having a range going from a million dollar cabin and guided zipline tours to camping and hiking allows for any lifestyle and budget. They also have designed the property so well that they really do have a wide-spectrum of what you might need. Wi-Fi and the usual amenities, but also it’s the little details that they are constantly working on. I don’t know if I would ever do an adventure trip again but if I would, I’d rather be in a place where I know it’s all taken care of. Overall, it’s a week that I hope when she gets older she never forgets. Maybe when she’s older she’ll realize why dad held her arms a bit tighter than normal as we crossed a few bridges…. Maybe she’ll look back and think how her dad let her go and have fun while I sat and watched the sunset. But either way, I’ll gamble an active trip like this will give her more solid memories than just something standard. 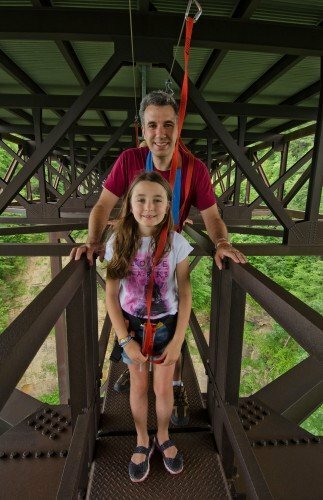 Dominick – We loved having you and your adventurous daughter join us at Adventures on the Gorge. It was funny reading your article, having spent some one on one time with you both, you seemed so excited…and relaxed…while you were here with us. Leading the World Outdoors is what we strive to do at AOTG and part of that vision is that it keep us focused on helping others test and try new things. It was great to know that we did that for you both. We look forward to guiding you on more adventures at some point in the future, so that you can try some of our other outdoor choices. As much as you did with us during your stay here, you both left quite a few check marks unchecked for next time!